Which formula do you want to use? Law of sines calculator - how to use it? This law of sines calculator is a handy tool for solving problems that include lengths of sides or angles of a triangle. We will explain the law of sines formula and give you a list of cases in which this rule can be deemed useful. Thanks to this triangle calculator, you will now be able to solve some trigonometry problems (more elaborate than using the Pythagorean theorem). This ratio is also equal to the diameter of the triangle's circumcircle (circle circumscribed on this triangle). Note that you can use this law for any triangle, also for a one that isn't a right triangle. The remaining sides of a triangle, knowing two angles and one side. a is longer than the altitude h from angle β, where h = c * sin(α) (a > c * sin(α)). You can also combine these equations with the law of cosines to solve all other problems involving triangles. Start with formulating your problem. For example, you may know two angles and one side of the triangle and be looking for the remaining sides. 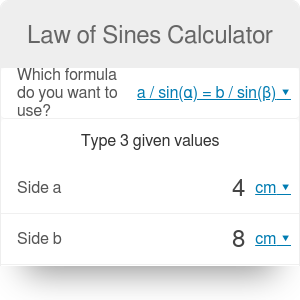 Watch our law of sines calculator perform all calculations for you! Law of Sines Calculator can be embedded on your website to enrich the content you wrote and make it easier for your visitors to understand your message.